Only 1 sim can fish at a time using each fishing rod so if you only have the park then only one sim can fish, if you have the park and campgrounds built then 2 sims can fish. If you don’t manage to click 3 times the fish will still spit out your sim and disappear but you will not earn a fish for the collection. If your sim just catches a fish or you save them from the giant fish you will earn a fish collectible. Every time you complete one of the 4 fishing options above your fishing hobby skill level up percentage will increase, once you reach 100% you will level up, there are 8 levels. You need to reach level 8 to be able to unlock all of the fish collectibles, once unlocked you will be able to find them. I think they changed it to 5 LP now as I am trying to unlock the third collection of fish and it shows that I will get 5 LP for doing so. I don’t know if that is just for the third one and then it will go to 3 LP for the next collections or if it is now just 5 LP for the remainder of the collections collected. How do I put the outfit on? When I go to a drawer or chest, it doesn’t give me the options for the full outfits. Do I have to make a new sim?? Can more than one sim do this task at the same time? Hi weightlessmagic! I just noticed you can also fish at the campgrounds. I’m going to have three sims fish with the 10 minute option to complete the collection faster (one at the park, one at the campgrounds, and one at the beach). I remember the first time I completed the collection with just one sim at the park a couple of years ago – it took weeks!!! 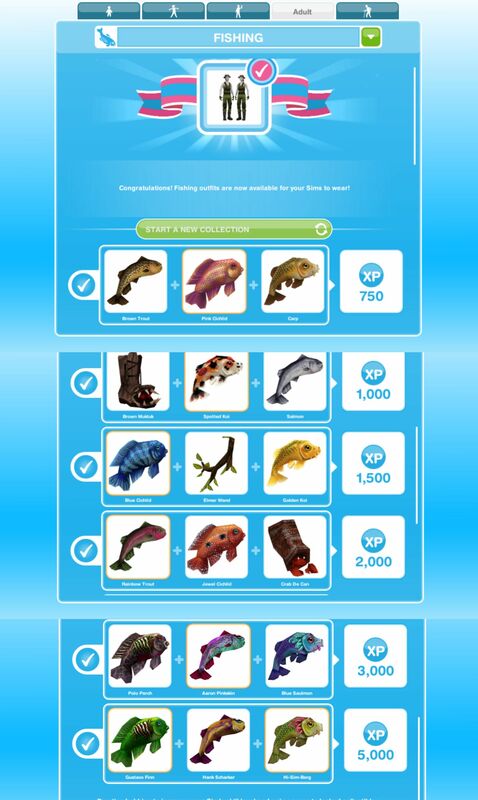 I’m restarting my collection now, because I didn’t know until I read your post that there are more prizes after the fishing outfits. Thanks! 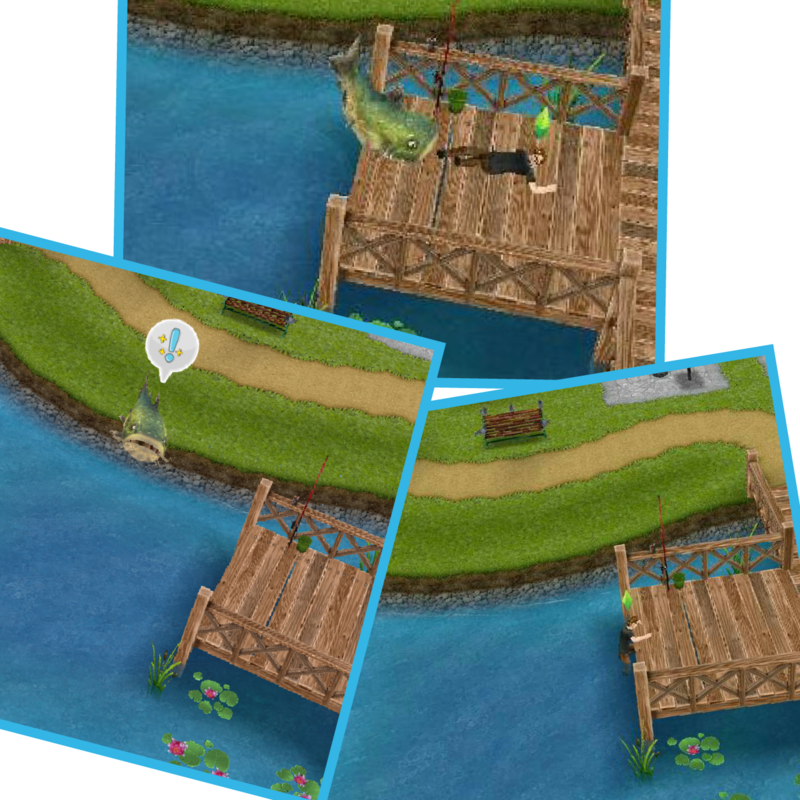 The fishing collection definitely takes forever when you are just using the park as there are 18 fish to collect! Thanks for all the info; that’s a lot of work. Do longer actions yield betterave catch or would you recommend doing the fastest one like for cooking? Hi! Thanks for this blog:) It makes playing the game so much easier.. I was just wondering.. For the hobbies, when you get one ribbon, the next one (Or few) would sort of light up right? To show you what’s next.. For my fishing (and a few other hobbies), it doesn’t light up, and I’m stuck getting the same fish over and over again.. I think I’ve gone fishing at least 10-15 times and I’m only getting the first 4 fish repeatedly.. Do you happen to know why? The next ones only light up if you are on the correct level so if you have found all up to level 5 but are not on level 6 yet you won’t be able to find the level 6 fish, once on level 6 those will light up and unlock the fish. To find out what level you are on go to the hobby tab, then if you have found all the fish in that level do the longest option until you level up as there isn’t much point doing the short options to find the same fish that you already have over and over. yes this can happen in the fishing hobby. Will my sim come back? I tapped on the fish but they both disappeared!!! Don’t worry, your sim will appear again after a few seconds! Am I the only one who thought it was weird, but still enjoyed, the Breaking Bad name parodies of the last few fish? How random was that? I found it rather amusing. No, I love that, too. Glad the app designers have a sense of humor and pop culture references! I have been fishing for several days but I’m still on the first level an tips to go quicker and thanks for doing this it really helps. I have completed the collection for the outfit but it is not in my wardrobe, why? How many sims can do this hobby at one time? A giant fish just tried to eat my sim, what should I do! Why haven’t I found a certain fish yet? If you choose the option to fish for a day, but you reach level two in five hours, do you continue to accrue hobby experience? Hi I just started playing Tue game and found ur blog very helping thank you so much…I HV a question none of my real friends play this game so I HV no neighbors. How can I add you as my neighbor? I hope this helps someone, for me this hobby is much less annoying since I discovered this! There are only 1 star lake at the park.. how can i have 3 star lake? If there is only one of an item it will only have 1 star, this doesn’t mean it is bad, there just isn’t another one to be rated against so it only has 1 star.